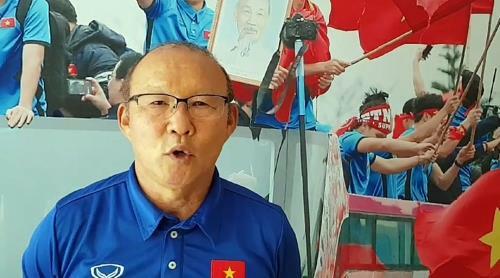 HANOI, Sept. 4 (Yonhap) — Park Hang-seo, the South Korean head coach of Vietnam’s under-23 national football team, who has been praised for leading his team to their best-ever finish at the Asian Games, said that he feels happy just to be with his players. Park’s team, which finished second in the 2018 AFC U-23 Championship this year, again made history in Vietnam’s football history by reaching the final four at the Asian Games that ended in Indonesia early this week. Park expressed regrets for his team’s failure to win an Asian Games medal but thanked football fans in both Vietnam and South Korea for their strong support throughout the games. “My team failed to win a bronze medal at the Asian Games but was given strong support and encouragement from the Vietnamese people. I was also aware of a lot of attention from South Korea. I’d like to express my deep thanks to all,” Park said in an interview with Yonhap in Hanoi on Monday. Looking back on the Asian Games, Park said the match against South Korea was the most challenging and burdensome. He said his team will now strive to produce good results at November’s Suzuki Cup, a biennial football competition organized by the ASEAN Football Federation and contested by the national teams of Southeast Asia. Vietnam will aim to win the Suzuki Cup for the first time in a decade. Asked to comment on his nickname, “the Hiddink of Vietnam,” Park downplayed the comparison to the renowned Dutch football coach who led South Korea’s football team to the final four at the 2002 World Cup co-hosted by South Korea and Japan. Park served as an assistant under Hiddink at that time. “I cannot be compared to him. I still have a lot of things to learn,” he said. The following are questions to Park and his answers. Question: What’s your impression of the final four finish at the Asian Games? Answer: We lost the bronze medal match in the penalty shoot-out but received much support and encouragement from the people of Vietnam. My fatherland South Korea also gave us a lot of attention. I want to give my deep thanks to all. Q: Would you review the match against South Korea in the semi-final? A: It was a most difficult match. It was psychologically burdensome to defend against South Korea’s powerful offense. From the beginning, the Vietnamese players were too passive. As the coach of Vietnam’s team, I will still do my best for the victory of the Vietnamese football team. 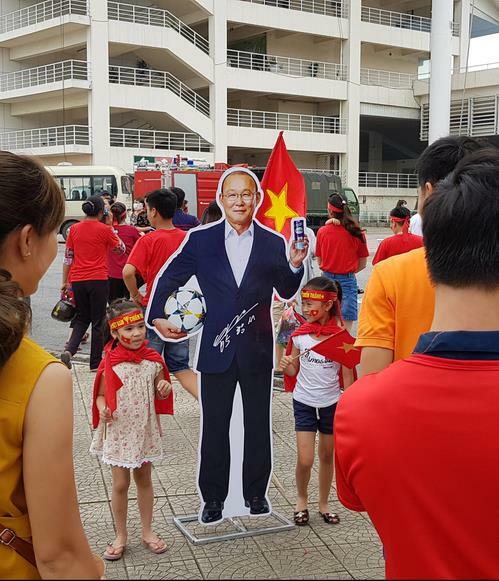 Q: What’s the secret of elevating the status of Vietnam’s football in just eight months? A: It has not been attained by myself alone. I was supported by many Vietnamese people and coaching staff. I feel happy and pleased just to be with the Vietnamese players. Q: Would you evaluate Vietnam’s football? A: It’s difficult for me to give an objective evaluation. But our team has yet to make it into the double-digit bracket on the FIFA rankings. I’m satisfied to be able to use my small knowledge, philosophy and knowhow to contribute to the development of Vietnam’s football. Q: What’s the improvement in Vietnam’s football? A: Some people say our players are physically weak but that’s not true. Some South Korean media said I instructed my players not to eat rice noodles. But, in fact, they eat rice noodles in the morning. I respect Vietnamese food culture. Q: How do you mix with the players? A: There is a language barrier but I always try to deliver my sincerity to them. I thank my players for their faithful efforts. Q: What’s your goal at the Suzuki Cup in November? A: I received praise and encouragement from Vietnamese people for better-than-expected outcomes from AFC Championship and Asian Games. It’s true that I feel psychologically burdened. I’ll well prepare for the Suzuki Cup to produce a good result. Q: What’s the future task for Vietnam’s football? A: The Vietnamese people love football, but the youth football system has yet to be completed. Vietnam should bring changes to its youth system in order to further develop its football. Q: What do you think of your nicknames like “the Hiddink of Vietnam” or “the hero of Vietnam”? A: The people of Vietnam gave me such nicknames for the better-than-expected outcomes, but I think I fall short of that status. I have also been likened to Hiddink but I cannot be compared to him. I still have a lot of things to learn.